Today's Holiday Greeting: Happy Festivus! Grove Lake: The world premiere was a couple Saturdays ago and it was pretty well attended. I guess some 400 people showed up to see the big picture including some of my family and , friends (Thanks everybody for coming!). I was a little nervous to see myself on the screen, but squinting my eyes seemed to help. As for the film itself, I thought it was very entertaining. The acting was top shelf and it was professionally made. My friend Wanita Spence proved she has the stuff of a movie star, almost walking away with the film completely. A couple of my scenes got cut, but that's to be expected when you're playing a character not too central to the plot. I was disappointed the scene where I threw worms at an old lady ended up on the cutting room floor, but that's showbiz! Christmas Party: Well, Touchy Feely Fotos' annual holiday get-together was fairly disappointing. The grub was actually tasty, but the gift they handed out was lame. We loyal, underpaid employees received a tote bag this year. A tote bag! I'm sorry, but that's not a quality gift, that's a public television pledge drive giveaway. As for the comedian they hired to entertain us, I vacated the premises before he got to perform. Since I never heard a peep about his performance afterwards, it's probably safe to say he sucked. However, my opinion may be clouded by my bitterness. 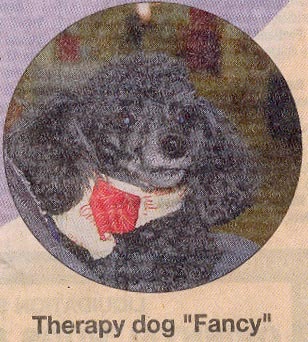 ALL HAIL THERAPY DOG "FANCY"! ALL MUST HAIL HER! Casting News: Well, it looks like all my years working at Touchy Feely Fotos has finally paid off because I just found out I was cast as one of the inmates in One Flew Over the Cuckoo's Nest. I think I'll be playing Cheswick. Scoop: I guess Touchy Feely Fotos hired a comedian to perform at this year's Christmas party. Why does that fill me with an ominous sense of dread? Weather: It snowed yesterday. It is not snowing now. Friendly Reminder: Grove Lake debuts at Pruis Hall this Saturday at 8:00pm and I guess admission is free! If you ever wanted to see my mug splattered on the big screen, this is your chance! ALL HAIL "FANCY"! ALL MUST HAIL HER!